NASA’s Interior Exploration using Seismic Investigations, Geodesy and Heat Transport (InSight) spacecraft is on its way to Mars. InSight launched on a United Launch Alliance (ULA) Atlas V 401 rocket at 4:05 a.m. PDT (7:05 a.m. EDT) this morning, May 5, from Space Launch Complex-3 at Vandenberg Air Force Base in California. There were no weather constraints at the time of rocket liftoff. 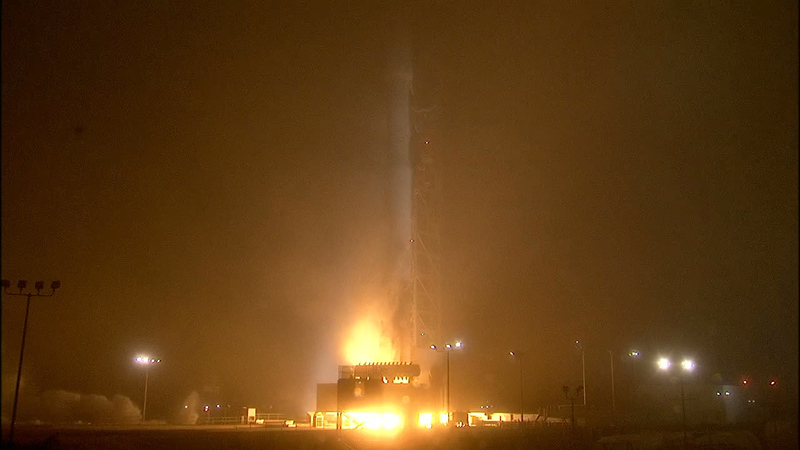 Launch occurred at the beginning of the two-hour launch window. Following two separate engine burns of the ULA Centaur upper stage, NASA’s InSight spacecraft separated from the Centaur to fly freely for the first time about 1.5 hours after liftoff. The spacecraft now is on its six-month, 300-million-mile voyage to the Red Planet. InSight will land on Mars on Nov. 26, 2018. InSight is the first interplanetary mission to launch from the West Coast, and will be the first mission to look deep beneath the Martian surface. It will study the planet’s interior by measuring its heat output and listening for marsquakes. InSight will use the seismic waves generated by marsquakes to develop a map of the planet’s deep interior. The resulting insight into Mars’ formation will provide a better understanding of how other rocky planets, including Earth were created. The InSight lander is equipped with two science instruments that will conduct the first “check-up” of Mars, measuring its “pulse,” or internal activity; its temperature and its “reflexes,” or the way the planet wobbles when it is pulled by the Sun and its moons. Hitching a ride with InSight was NASA’s technology experiment, Mars Cube One (MarCO), a separate mission of its own, also headed to Mars. The two mini-spacecraft, called CubeSats, launched one at a time from dispensers mounted on the aft bulkhead carrier of the Centaur second stage. They were designed and built by NASA’s Jet Propulsion Laboratory in Pasadena, California, and are the first test of CubeSat technology in deep space. 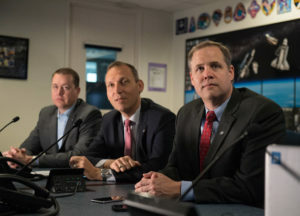 Their purpose is to test new communications and navigation capabilities for future missions, and may provide real-time communication relay to cover the entry, descent and landing of InSight on Mars. InSight’s lander will spend two years investigating the deep interior of Mars. For more information visit https://www.nasa.gov/mission_pages/insight/overview/index.html. This concludes today’s coverage of the InSight countdown, launch and ascent into space. It’s an exciting day for NASA. The agency’s twin Mars Cube One (MarCO) mini-spacecraft have launched from dispensers mounted on the aft bulkhead carrier of the Atlas V Centaur second stage. Designed and built by NASA’s Jet Propulsion Laboratory in Pasadena, California, MarCO will be the first test of CubeSat technology in deep space. They are designed to test new communications and navigation capabilities for future missions and may provide real-time communication relay to cover the entry, descent and landing of InSight on Mars. We have spacecraft separation. Cheers and applause can be heard from the launch teams as the InSight spacecraft separates from the United Launch Alliance Centaur upper stage to fly freely for the first time. The second engine burn of the Centaur upper stage has begun and will last for about five minutes. The United Launch Alliance Atlas V rocket reaches another major milestone on the road to T-Zero, as NASA’s InSight spacecraft prepares for launch. Stacking the rocket begins with the booster – the largest component – and continues with the addition of the Centaur upper stage. InSight is slated to launch aboard the Atlas V 401 rocket Saturday, May 5, at 7:05 a.m. EDT (4:05 a.m. PDT) from Vandenberg Air Force Base in California. Watch the T-Zero video at https://youtu.be/U3tNa0sxmu0. The launch campaign heats up for NASA’s InSight spacecraft and United Launch Alliance Atlas V rocket at Vandenberg Air Force Base in California. The Mars-bound probe is secured inside its protective payload fairing, then moved overnight to the launch pad, where it’s lifted into position atop the waiting Atlas V. Also on board are two small communications-relay satellites – MarCO-A and MarCO-B – intended to become the first CubeSats to venture into deep space. View the T-Zero video at https://youtu.be/YKVhjdWitsg. 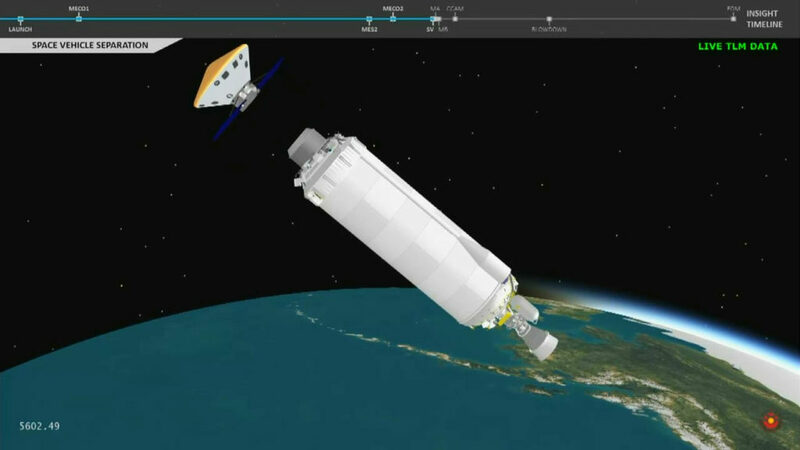 The first engine burn of the Centaur upper stage has ended. Centaur with NASA’s InSight spacecraft and MarCO is now in a coast phase. The Centaur upper stage main engine has started its burn following on-time booster engine cutoff and Atlas/Centaur separation. The first of two burns for the Centaur main engine start will last nearly eight minutes. The payload fairing has been jettisoned. Booster ignition and liftoff of the United Launch Alliance Atlas V rocket at 7:05 a.m. EDT (4:05 a.m. PDT), from Space Launch Complex 3 at Vandenberg Air Force Base in California, carrying NASA’s InSight spacecraft. The rocket is on its way, carrying NASA’s Interior Exploration using Seismic Investigations, Geodesy and Heat Transport (InSight) to begin its six month voyage to Mars. About four minutes into flight, a series of key events occurs in rapid succession: Atlas booster engine cutoff, separation of the booster from the Centaur upper stage, ignition of the Centaur main engine for its first of two burns, then jettison of the payload fairing. The InSight countdown is underway, proceeding toward a liftoff at 7:05 a.m. EDT (4:05 a.m. PDT). During the last four minutes of the countdown, the Atlas and Centaur propellant tanks will be brought up to flight pressure, the rocket and spacecraft will be confirmed on internal power, and the Western Range and launch managers will perform final status checks. A computerized autosequencer will take over the countdown in order to conduct a host of activities in precise order. Hitching a ride with InSight is NASA’s technology experiment known as Mars Cube One (MarCO), a separate mission of its own. 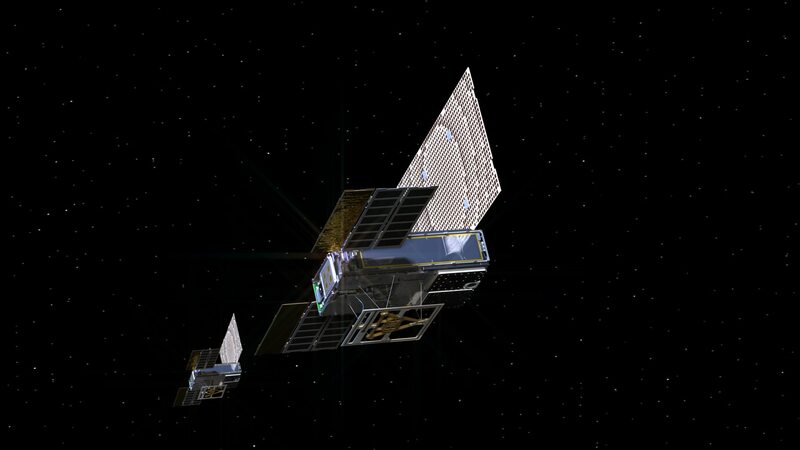 Designed and built by NASA’s Jet Propulsion Laboratory in Pasadena, California, MarCO consists of two mini-spacecraft and will be the first test of CubeSat technology in deep space. They are designed to test new communications and navigation capabilities for future missions and may provide real-time communication relay to cover the entry, descent and landing of InSight on Mars. After InSight has separated from the Atlas V Centaur second stage, MarCO will launch one at a time from dispensers mounted on the aft bulkhead carrier of the second stage. For more information about MarCo, visit http://www.jpl.nasa.gov/cubesat/missions/marco.php.